The power to heal is part of Naam. Many persons experience Naam connection in life while doing Ardas , Listening or reciting Gurbani or Simran. . What further required is to shift towards the thinking pattern where Naam is part of the life style. Naam becomes part of our thinking when we make efforts for acquiring knowledge about Naam and change our attitude towards that of acceptance to let it be part of us as a personality change. This change of attitude is important since we normally act the way majority of persons around us act. Our mind since birth has learnt our way of thinking, our way of selection of choices and our way of living the life out of experience and interaction with the world around us. Our mind conforms to social and other norms. To shift knowledge is required first. Our Gurus have given us this knowledge source in the form of Gurbani. Our Gurus have also explained the way to Shift and benefits the change brings. The change is coming out of present misery into a world of anand, abundance and love. The Shift brings us closer to the creator. Acquiring Knowledge is important. In fact it is the start of shift process. The gurbani lays great emphasis on this aspect. The process is known as ‘Vichar’ – contemplation which an aspect of Simran. Without contemplation Simran lacks progression and the gursikh feels nothing is happening. Gurbani asks gursikhs to share so as to make learning a sangat effort (community affect). Let us look at certain important aspects to know more about power of Naam. Then a diagram to illustrate these and most of all about “The Illusion and Reality about Time” the way Gurbani explains it. Knowing about time lets us experience power of Naam in healing which we normally do not access because of the veil of Maya. The knowledge that Gurbani imparts has an evolving nature. The levels of knowledge Gurbani gives move us further up as we move up. With one step next step is known. This is how the veil of Maya is pierced so as to be enlightened. The veil of Maya has as aspects to keep us rooted towards remaining as such believing and living the way the majority lives in this world. Its potent mind tools are “Resistance to change” and “doubt”. Gurbani’s first word is ੴ (Ek ongkar ). Gurbani starts with The Mool Manter - the Manter (Root Verse) to know about the Origin and reality of creation and about creator. The Ek Ongkar is the first word. The Mool means “main source”, “the Root of Origin”. So Manter word historically refers to secret word or verse which is to generally repeat as a chant to achieve the intention behind it. The Chanting is the way to control the mind. Whereas the Gurbani states that the Mool Manter has to be repeated in the form of Jap. At the end of the Mool Manter this direction is clearly stated in the form of the word “Jap” so that the method is made clear is to repeat again and again keeping focus. Jap has a purpose. This purpose is to have experiential knowledge. This form of knowledge comes from within as a revelation, an understanding that gives wider meaning. It comes as an inner experience in the form of Knowing. The Sikh is in touch with the Guru within. The Mool Manter talks of One creator and Oneness as a Mool of the world we live in. The Second word explains more about the structure of this world in one word: ਸਤਿ ਨਾਮੁ Only Naam is Satt (true). The truth is always same. It remains unchanging forever and thus permanence is its main feature. When there is truth then there is false too. These two coexist so as to define and give experience of their nature. The created world thus has two parts one that is permanent and the other that is not permanent meaning subject to change. The world is said to be creation having veil of Maya (a curtain that is concealing reality). This Veil most of all conceals the source of origin and power that supports flow of creation which is Naam. The veil acts by creating doubt, confusion and misdirection. The mind overlooks the obvious. The mind protects the existing beliefs. The mind aligns with Maya and resists look at the reality of existence beyond. There is nothing wrong with Maya as it is doing its Job as an important part of creation. Some say that the Worldly creation is an illusion (Maya) and does not exist in reality. Others state that world is real and has true existence whereas all else is fiction. There are so many views about creation and creator (Well the sustainer of illusion the Maya does an efficient work). Gurbani explains that truth is known through the Guru only. The only true guru is the formless and omnipresent creator who has taken this role, any one professing otherwise is affected by Maya. Only creator is beyond the influence of maya. The source of Gurbani are the hymns that have come through the Saints one with the creator. The Gurbani shifts the state of mind of the one that utters and connects with the Mool –the Naam. The guru is within us and as such guides. The gurbani words are both knowledge and inner experience. These shine within the mind when contemplating them and light up with knowledge. The Mool Manter in gurbani explains that this world has two parts one Naam that is permanent and the other is visible world which is not permanent so is ever changing. The cycle of birth-sustenance and death afflicts the visible and the known world. The physical world is real in that it is a creation wherein the creator too resides “Eh jag sache ki hai kothri. Sache ka vich vaas”(SGGS, M 2, p. 463)” . However it is an illusion too since its structure is a creation that gives illusion of being having real existence. This play lets the non-visible create a world where the creator expresses through variety of experiences and existences. Gurbani lets these be experience but asks to remain connected with the Mool. The Maya is Illusion in creation and Illusion in the minds with a purpose to let the play exist. Knowing of truth comes through piercing the Veil of Maya. Maya hides much and one aspect of creation is Hukam which Maya hides well from knowing. Hukam (ਹੁਕਮਿ) is a Punjabi word derived from the Arabic hukm, meaning "command" or "order." In Sikhism, Hukam is the aspect of Naam that keeps natural order. The universality of Hukam is like a lay that defines way world evolves, takes form, acts and reacts. From a seed the tree forms exactly is Hukam. From the womb the body develops and the body takes shape is Hukam. The Sun, the planet , the stars , the galaxies form act in regularity is Hukam. Hukam is the universal order. In Gurbani looking at the underlying play of the Hukam in this world is part of Simran and leads one to understand oneness. The presence of creator in creation. Looking at the play of Hukam plays important part in healing as we will see later. Time is the less known and discussed part of Gurbani. In fact it is vital. Understanding Time is to bring healing as the illusion of time is one major factor that let sustains the illness within the body. Here again in clear terms the Sach (truth) part of creation is said to the unchanging true aspect in the creation from the time before the creation came into existence, the beginning part of creation, the present and the future. The Naam thus is permanent and ever existing. Naam is timeless. So the creation through inference has time aspect attached to it. Thus there is no Time outside of creation but exists within the creation as a part of Maya. we do not know the appointed time of our departure. We live in the present. We live in one moment but experience the illusion of linear time. The present day science also accepts the view of present time. There are different times classified. There is linear time, there is biological time, there is perceived time (long or short), there is chronological time. The data with science is so complex that different theories exist. There is a theory about existence of parallel worlds. There are still many unexplainable facts about the world and how the creation functions. It is also so complex but perfect. Everything happens perfectly. However when we contemplate it is found that past is just a memory. All experiences are a memory. The future is yet to happen and may change. The future is uncertain and only some aspects of it are predictable so as to enable us to act. We in fact are shifting from one moment to another. We move from one present to another. The Hukam ensures that the physical world too shifts to align with our previous moment and then with next moment. This shift creates linear time and our experience. We are trapped in conventional view of time. Just like everyone else, the time is viewed as finite in a strictly linear fashion. In this view of time we move ahead in one point to another. We do not realize that this limited concept of time is imprisoning. There are many scientific theories postulated about time. The conventional view is that time can only move forward but not backwards. However, scientists suggest differently. For them time is a way used by us to organize and make sense of events classifying them in the order of happening into the events that happened first and those events that happened later. If there is no concept of time then everything would appear to be happening at the single point in the present moment. Spiritual teachers often allude to time as an “illusion”, and that there is only the here and now. Always there is now and perception of movement. Coming out of discussion on time let us see how this helps in healing. Given the new concept of Timelessness in Naam connection and Now being the only reality then it means our bodies disease and illness shifts to align with our belief in the events that happened in the past and expectation about outcome in future. We have memories of the past events and expectations about what would happen in future. Being memories we can always reinterpret them. We can always let go of associated fears, resentments and perceptions. So as a first step think of these as only experience that was lived and now a part of history. You learnt lessons from that experience and are now ready to let go. ਫਰੀਦਾ ਬੁਰੇ ਦਾ ਭਲਾ ਕਰਿ ਗੁਸਾ ਮਨਿ ਨ ਹਢਾਇ ॥ Fareed, answer evil with goodness; do not fill your mind with anger. He does not die, so I do not fear. He does not perish, so I do not grieve. He is not poor, so I do not hunger. There is no other Destroyer than Him. So as a next step recite Gurbani. Feel connected to Naam by feeling for HIS presence. To Feel HIS presence within and everywhere just keep thinking that it is so whether felt or not He is present. Recite gurbani with inner feeling of connection. Be in meditative state. Keep your awareness inward within you. The more you go within the more you would be detached from the influence of Maya. The more would be Naam connection. In such a state know that being jyote swarope that is perfect and without any disease. So then its creation the physical body too is free from disease. Feel that your body has new energies. Feel that it has healthy organs and body system. Know that in the future too the same state of body would remain. When this meditation is done in Amrit vela (early morning before 6.00 am) then it is very effective. Initially mind would resist. But persist and go within. Keep reciting gurbani. Initially one may listen to Shabad kirtan for mind stability and concentration. But then shift to personal recitation. Choose any Shabads. Make your own compilation or choose those compiled by others. The Boy who was cured of Paralysis..
"Miraculous story of a boy from Kashmir who experienced total recovery at Shri Harmandir Sahib left everyone in surprise. He went inside the Sacred sanctuary of Guru Ram Das ji on a wheelchair and came back standing on his own feet. A few months ago this boy suffered from paralysis in his legs and arms, and also was unable to properly communicate. Then the family brought him to Darbar Sahib and carried him inside where they did Ardaas, and immediately the youth stood up and regained power in his arms and legs, and soon after began to talk. The incident occurred on 23rd Feb 2016." 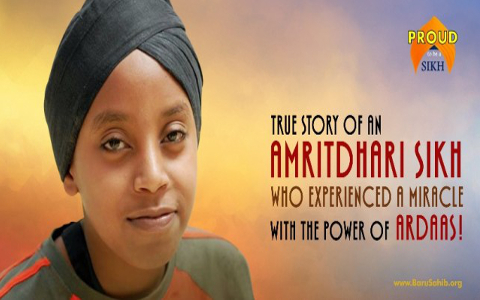 Amritpal Singh is a born-Kenyan-African-Sikh, and who experienced a miracle at Gurudwara Sahib Kericho. As a young child he never had any teeth. One morning at Amritvela he did an Ardaas in front of Sri Guru Granth Sahib, asking for teeth as the other children used to laugh and mock him. With Guru Sahib's Grace, his body froze like a rock as he lay on the floor in front of Guru Sahib. Knowing some...thing mystical was happening, the Giani Jee asked the few people sitting in the Darbaar Sahib to leave, and closed the doors. Only Amritpal and Guru Granth Sahib were left in the Darbaar Sahib. After an hour or so he got up from the floor. When the Sangat and Giani Jee entered the Darbaar Sahib again they discovered that Sri Guru Granth Sahib Jee had performed a miracle by blessing Amritpal Singh with a full set of beautiful teeth! This is a true account that we has been verified verified with Amritpal Singh who lives in Kisumu, Kenya. He is pictured here from a Sikh Youth Gurmat Camp held in Kericho in 2007 when he was 15 years old. He lives the life of an Amritdhari Sikh. These two are examples where Time factor had no meaning. Healing came from a timeless state. In our physical world if we have no beliefs about past - future linear action and have strengthened The present concept the healing would occur instantly. In these two cases these boys got healing when they Shifted and touched state of Naam during Ardas which gave them healing.which gave them healing.